The first look of Allu Arjun’s Duvvada Jagannadham was out last week and is a hit on the internet. Sporting a brahmin look, Bunny’s new makeover created quite a stir on social media. The makers have unveiled the teaser cut of the film, which has opened to great response from fans. Last seen in the blockbuster film Sarrainodu, Allu Arjun is joining hands with director Harish Shankar, who is known for blockbusters like Gabbar Singh and Mirapakay. Already DJ first look poster grabbed the attention of mega fans and audience. After the first look, Everyone waiting to see the teaser of Duvvada Jagannadham. Now, The wait is over, Makers released the DJ official teaser Today i.e February 24 at 9 Am as Maha Shivaratri Festival Special to the audience. The actor redefines and sets a new style with every film but his new look in Duvvada Jagannadham (DJ) makes us believe that the actor can fit in any shoes and still slay effortlessly. 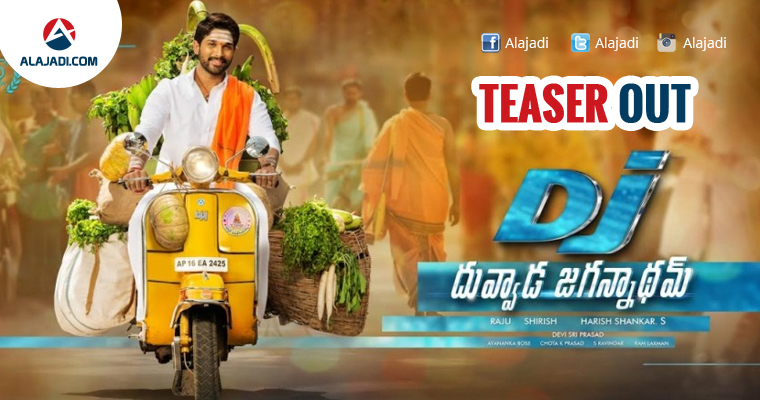 The teaser of DJ shows Bunny playing an orthodox Telugu Brahmin cook in crisp whites who seems to have been disturbed by sizzling beauty Pooja Hegde. However, with those good looks, it seems Arjun is not just limited to praying with a rosary. We are sure, there is more to his character. Meanwhile, Allu Arjun is also making his Tamil debut as he signed another project with ace Kollywood director Lingusamy. Keerthy Suresh might play as the female lead opposite Arjun in the film. The film will start rolling from March after he is finished wrapping up his part for DJ. According to the latest buzz, Popular TV Channel Zee Telugu has acquired the satellite rights of the movie for the whooping price.